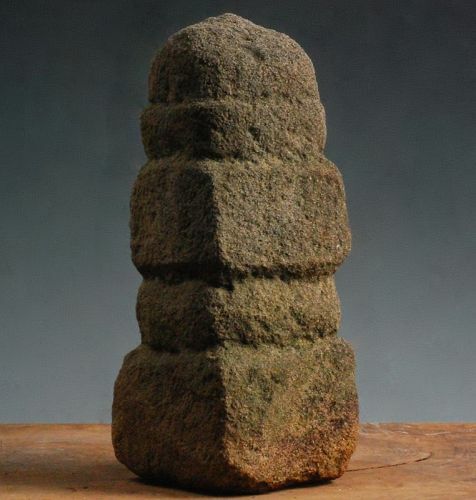 Stone Sculpture Gorinto 5-Tiered Stupa Pagoda Early-Edo 17 c.
Please refer to our stock # 807 when inquiring. Gorinto (5-tiered stupa) sculpted in one piece from an ochre-hued sandstone. Early-Edo Period ca. 1650. Very minor old loss. The gorinto is a uniquely Japanese style of stupa comprising five geometric forms, which correspond (from bottom) to earth, water, fire, wind, and ethereal space. The Japanese Shingon sect of esoteric Buddhism views the gorinto as a symbol of Dai-Nichi Buddha, who, underlying all things, manifests himself in the five elements making up the physical world. A charmingly small-scale gorinto. Uncommon.